We get stopped everywhere we go! Folds up super small, with a buckle strap to keep it folded nicely w/ a carry handle. The fabric is a dream to clean. When weâ€™ve gotten chocolate or anything hard to clean, we have just power washed it and let it dry and itâ€™s good as new! Highly recommended. Nice, good... Not very heavy... Easy fold..
We LOVE our new Quinny Zapp Extra! My daughter is 13 months old and we were looking for a convenience stroller... but didnâ€™t see any point in paying tons of money for one when you can get them for much less... I actually ordered a summer infant one... and while that was in the mail.... the sale price of this one caught my eye! I ordered right away, package came quick and we have not been dissapointed. It turns on a dime, folds supper compact and the purple color is way more of a dark violet in person... not obnoxious at all. My baby especially loves the mommy-facing position! Not many convienience strollers can pull that off! ProsForward facing, lays flat for naps, turns easily. 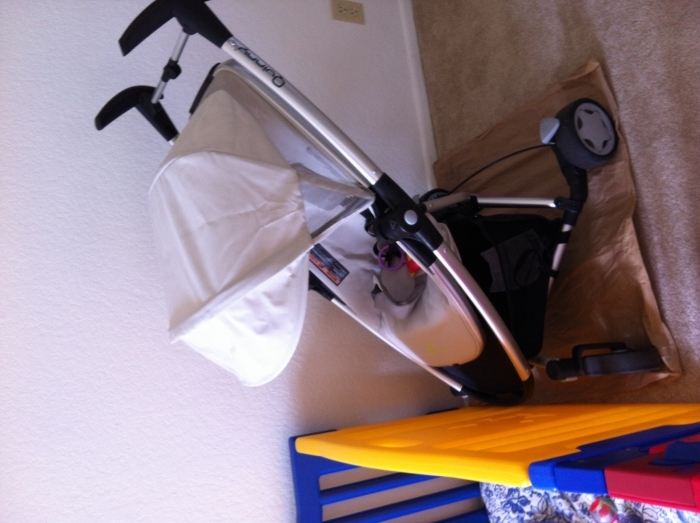 ConsIt?s not the easiest stroller to fold down but after a few go?s at it we?ve got it down. I was so excited when this stroller arrived. it's everything an more I thought it would be. Lightweight, durable, and fashionable. I didn't want black, we live in the South and it gets hot in the summer so I wanted something that would hide the dirt but not be black. Love it! I like how this stroller is very light weight and small. But i dislike how its too close to the ground and the handlebars are so shakey. I tried to use the stroller going down some stairs and its not possible, the stroller locks and its just not strong enough to go up and down stairs. I love everything about it. Compact, easy to steer, nice color. The reclining seat is fantastic. I bought this stroller for my 2 1/2 year old Granddaughter and I must say that i love it. Easy to navigate, easy to recline and perfect for long walks. The only downside opening and closing it, but once you get the hang of it, it becomes less difficult. Fold to a tiny footprint, lightweight, sturdy and turns on a dime. Minus one star because if you want to store it upright, the handles rest on the ground, but that's my only complaint. I'm on my 3rd kid (after a 10 yr break), and just purchased this to replace a larger travel system. I absolutely love it. Sleep, sturdy, compact and light. The only downside would be that the handlebars do seem a little low, which works for me since im 5'1, but my husband is 6' so he'd have to bend a little.Besides that, awesome product and as usual, Albee baby is the best and cheapest place to buy! Bought one for a friend who lives in a densely populated city overseas. My friend did not want a twin stroller because it would be impossible to push around. He picked this for its versatility and compactness and now thinking about getting a second identical stroller. We have been using the Zapp Xtra since our son was born 6 weeks ago. It works very well with the rearward facing Maxi Cosi seat. We have used the stroller around the neighborhood as well as on car trips and three flights so far. It has been very smooth to push and is very easy to attach and release the rear facing seat. It also folds down and back quickly which is great for quickly getting in and out of an uber on a busy street. Amazing stroller, very compact and can fit anywhere! Also love the pink! This product should not be purchased and should be recalled. My son's hand was pinched very badly by the support for the cover. The metal bar that holds it up can pinch the hands or even break a wrist if the child is holding on to the frame which many do. 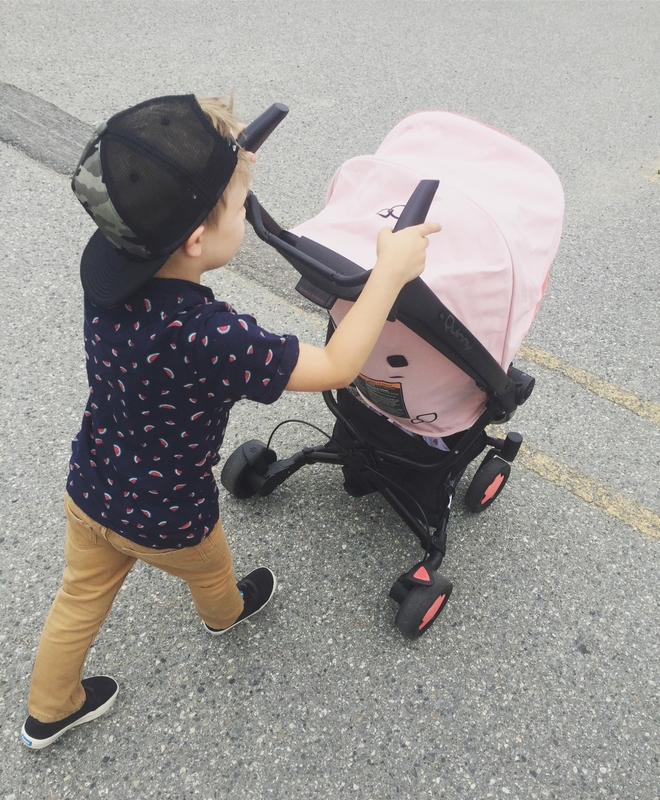 I recently purchased this stroller and LOVE IT! I have a super bulky Mountain Buggy and this is a such a nice alternative for everyday zipping around town/parks and traveling. The fabric is soft but sturdy with a cushy seat so it's super comfortable for my 6 month old. She absolutely LOVES it. Only assembly required is clicking the wheels in place so it's extremely easy. Directions are easy to read but I recommend watching a few youtube videos beforehand as it helps tremendously. I have not had any issues folding and anyone can get the hag of it with a little practice. Some people complained that the stroller handles are short. I'm 5'9 and the handles are fine with a few more inches of room before I would consider it "too short". I wish I bought this stroller sooner. You can't go wrong with Quinny. It's such a good price right now so you kinda "have" to buy it, right?! loving this new model. we had the older model, and I was not sure I would like the newest version. It is a bit bigger, but really just as convenient! travelling with it is totally awesome! Best Usesquick trips around town, and travelling abroad. 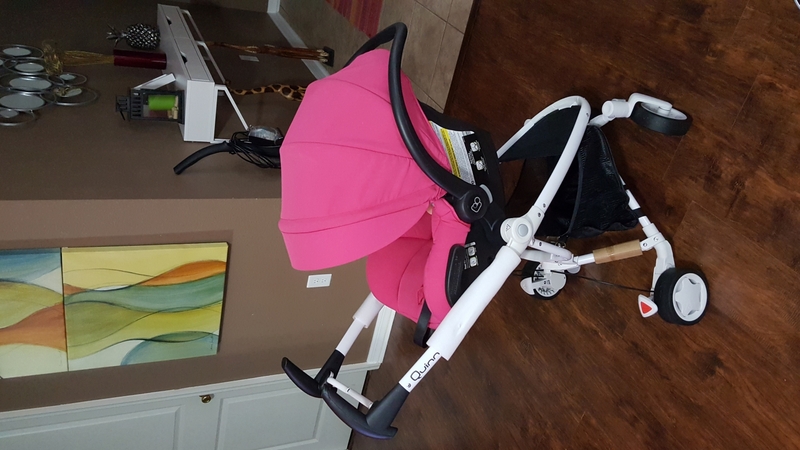 Love the stylish look of this quinny stroller and got it at a very good price. Look very sophisticated in person and also quite sturdy. The baby looks very comfortable in it. This stroller is very hard to close. Its also not good in grass and up hill. Don't buy this stroller if you are looking for ease. Easy to assemble, looks modern and chic, compact and easy folding capability, and multiple seat position options are great! good package, delivery and quality! My girl likes it very much. It helps the girl to sleep easily! when we went shopping , people always asked me where I bought it. wonderful stroller! It's quick to assemble and it made it easier for me to go out with my little one. 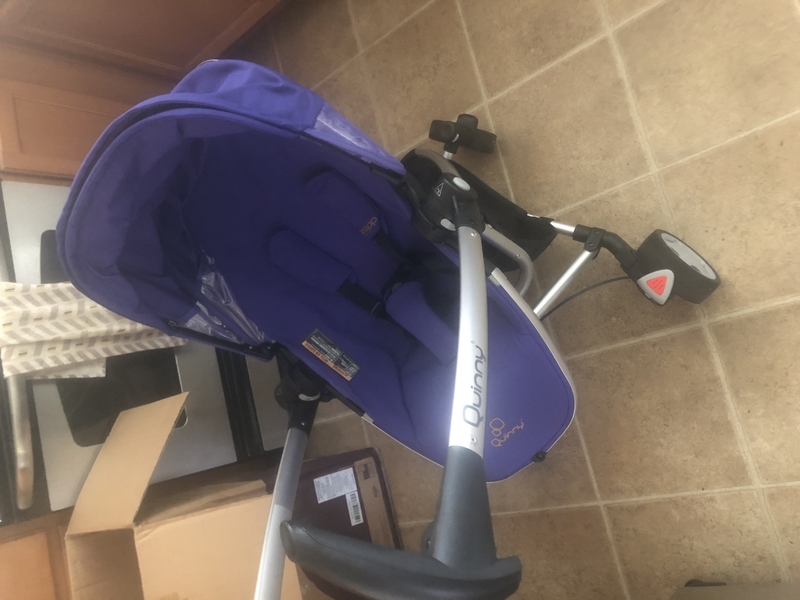 Good travel stroller not the best but for the price overall it does its job! It's not intended for tall parents as this stroller is very short! it made going out with my baby so much easier now. it is so easy to open and fold it. 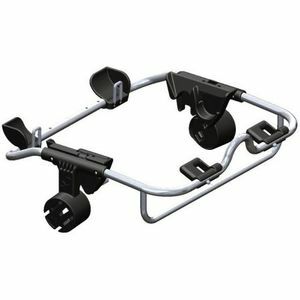 ProsLarge canopy, reclines, can face forward or rear, easy to open up and fold back, light weight, simple yet everything you need. ConsA larger storage underneath would be nice, but nothing I couldn't live without. 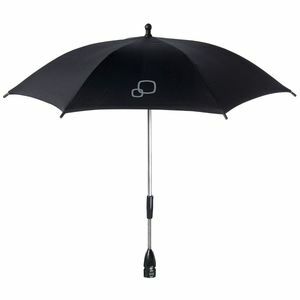 We opted to buy this instead of an umbrella stroller and so glad we did. It still folds small enough to travel with and has great options! The item is absolutely GORGEOUS! Color is so bright & vibrant. Its also extremely light weight. Can't wait to put my baby boy in it. Would've given it 5 stars but we haven't had the chance to actually use it yet. Loved everything, but the folding. No auto latch when folded. This stroller is so beautiful and my daughter loves it! The best is it can be forward facing or parent facing. Very light and easy to store. I'm a big fan of the Quinny line of strollers. I bought the Quinny Buzz before I was even pregnant. Once I put it in the back of my car I knew I needed something smaller for traveling (we do a lot of car traveling) and I looked into the Zapp Xrra. I wanted something with the size of an umbrella stroller with the bells and whistles that I loved about the Buzz. The Zapp Xtra folds down really small takes up so much less of the trunk of the car. It's comfortable enough, I'm short, my husband is 6'0 and doesn't have any problem with the height of the stroller. It doesn't have adjustable handles, but they're positioned well. Best UsesTraveling with the little one. I love how the stroller rides and how compact it folds. 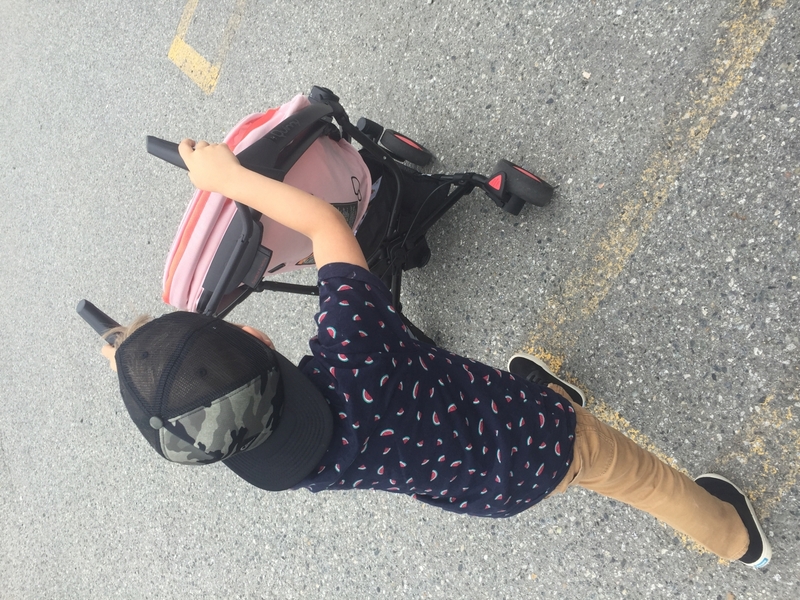 The stroller reclines nicely and I love the feature of forward or rear facing. The only thing I wish could be changed is that I could add a roller board. I've recommended it to friends already! Super psyched about the Zapp from QUINNY- cool look, great quality, excellent functionality--and if you love PURPLE-super value!! Best Usesquick trips or for traversing tight spaces and for users whose lifting ability is limited. One handed flexibility. Such a great stroller, folds up so small I can carry under my arm. I love the red color, makes a total statement. Canopy fully covers my baby. Storage below is great. Love the handle bars and turns easily. Stroller folds so small but deploys as a full scale stroller. Turn radius, ease of pushing stroller is great! My daughter loves it! 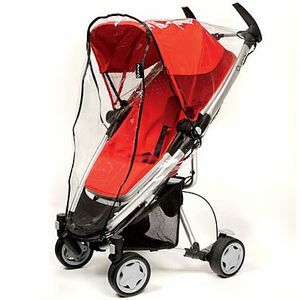 Canopy fully covers from the sun, I would recommend this stroller to all moms! I am so excited about the new folding design for this stroller. Hubby and I took turns following directions to make sure we got all instructions down. We did have an issue with the beck folding pedal, but it turned out that the break was not set all the way. I recommend folding the seat and handles, then resetting the break and the stroller folds smoothly every time! I LOVE IT! Love the new folding seat feature!!! 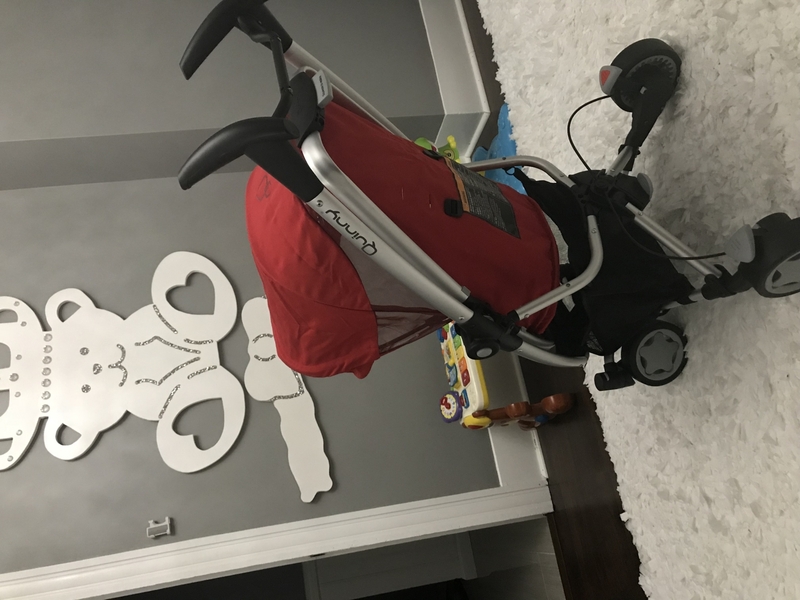 The Quinny Zapp Xtra was the perfect stroller for our needs but the only con was that you have to remove the seat before folding. Thank you Quinny for listening to your customers! 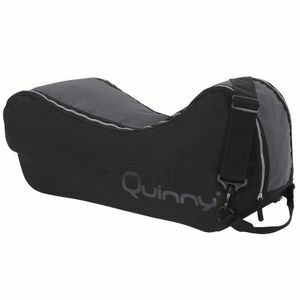 It is super easy to fold and saves time with the Quinny Zapp Xtra Folding Seat! Stroller is light and folds so compactly which is perfect for traveling and gate checkin. 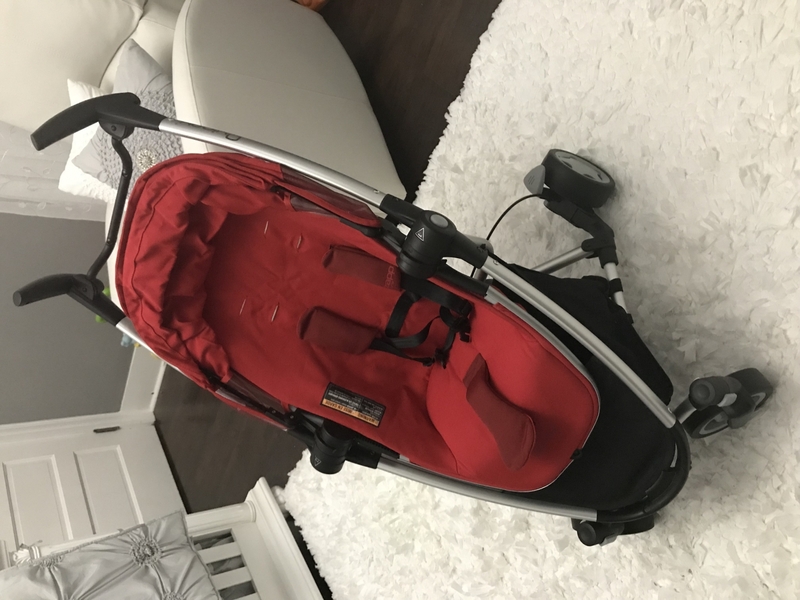 We use this as our everyday stroller and for traveling! Pricey but worth it since we no longer need two strollers! The product is pretty good considering its price. We received our Zapp Xtra last week and absolutely adore it. We owned a Zapp in 2006 and the improvements made since our phenomenal. The recline, the storage, and the extended hood are all features that we were missing with our first and are absolutely loving on our new Zapp. My son, at age two, seats very comfortably in it (today he asked for his Zapp over a shopping cart seat when we were out running errands), it is very easy to open/close, and fits quite compactly in the boot of my car. We own the Purple Pace color and it is vibrant and easy to clean. No complaints whatsoever. My baby is 6 months now. We use the stroller so much at home And even to take a ride. My baby loves the stroller. It's confortable For him And for me. My baby is 6 months now. We use the stroller so much at home And even to take a ride. 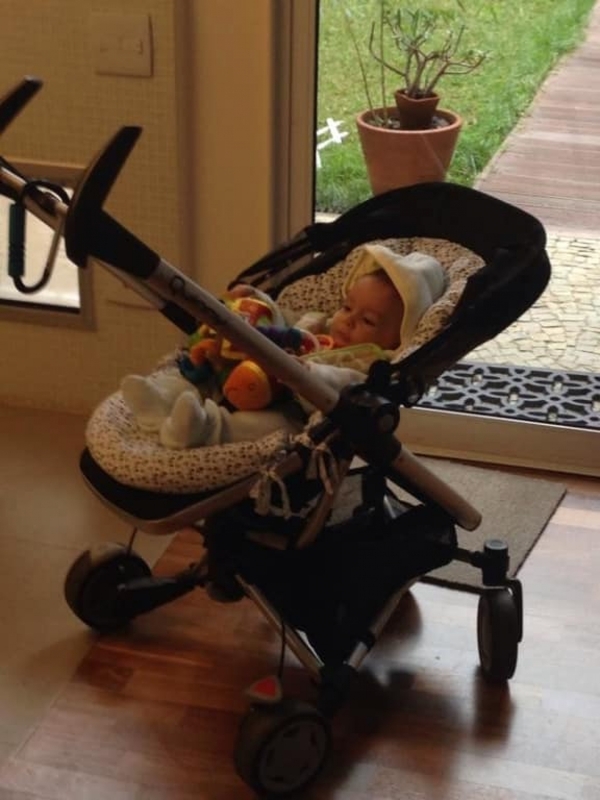 My baby loves the stroller.It's confortable For him And for me. I wanted to love this stroller, but the wheels were horrible and the steering definitely required both hands. I couldn't use it to walk my dogs or at festivals (grass), and I babywear for errands, so there was just no use for it. If you plan to use it in malls, stores, airports its probably perfect. I like the seat design more than any other stroller, but its not worth it if i can't push it anywhere. One word to describe this stroller is temperamental. Sometimes it closes well, sometimes it doesn't. Sometimes the seat comes off, sometimes it doesn't.In the two weeks or so since the purchase, my wife hasn't been able to fold/unfold it successfully even once. To add to that, we pulled it into a playground with sand on the ground, and the sand got in the way of its mechanism, after which it just refused to close or open or even brake. I ended up removing the sand from the wheels and the little wheel holes and the little notches which fix the stroller in open position. Then I used an oil lubricant and applied copious amounts of it to every moving part I could find. That made the operation much better.The one saving grace is that the little kiddo seems to find it comfortable.If asked, I would suggest to not go with this halfway priced stroller. Either go with a high priced one, which gives a lot more comfort and options, or go for a low end one, which at least you wont feel bad throwing away if it doesn't work out. This costs quite a bit, but doesn't deliver as much. Now folds with seat. Designed for urban living: With its sleek, modern design and lightweight compact fold, the Quinny Zapp Xtra is ready to go wherever life takes you. When used with a Maxi-Cosi Mico infant car seat, your child can profit from the exceptional ease of use of the Quinny Zapp Xtra from birth. 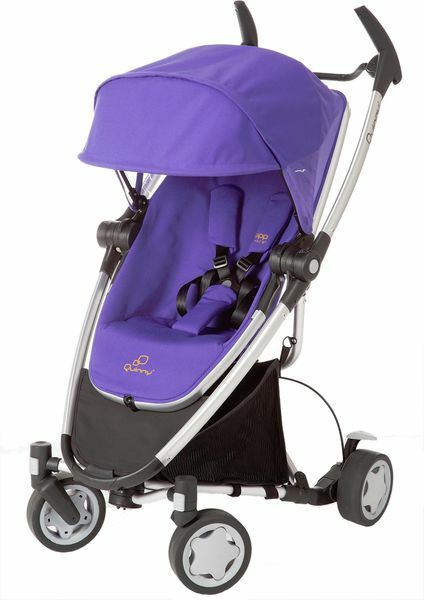 The Quinny Zapp Xtra lets you enjoy a hassle-free life with your child. Its reversible and reclining seat allows you and your child to travel your way. For children up to 50 pounds. An ideal travel system that can be used from birth when combined with the Maxi-Cosi Mico infant car seat (adapters included).